A cell culture model of resistance arteries is described, allowing for the dissection of signaling pathways in endothelium, smooth muscle, or between endothelium and smooth muscle (the myoendothelial junction). The selective application of agonists or protein isolation, electron microscopy, or immunofluorescence can be utilized using this cell culture model. Biwer, L. A., Lechauve, C., Vanhoose, S., Weiss, M. J., Isakson, B. E. A Cell Culture Model of Resistance Arteries . J. Vis. Exp. (127), e55992, doi:10.3791/55992 (2017). The myoendothelial junction (MEJ), a unique signaling microdomain in small diameter resistance arteries, exhibits localization of specific proteins and signaling processes that can control vascular tone and blood pressure. As it is a projection from either the endothelial or smooth muscle cell, and due to its small size (on average, an area of ~1 µm2), the MEJ is difficult to study in isolation. However, we have developed a cell culture model called the vascular cell co-culture (VCCC) that allows for in vitro MEJ formation, endothelial cell polarization, and dissection of signaling proteins and processes in the vascular wall of resistance arteries. The VCCC has a multitude of applications and can be adapted to suit different cell types. The model consists of two cell types grown on opposite sides of a filter with 0.4 µm pores in which the in vitro MEJs can form. Here we describe how to create the VCCC via plating of cells and isolation of endothelial, MEJ, and smooth muscle fractions, which can then be used for protein isolation or activity assays. The filter with intact cell layers can be fixed, embedded, and sectioned for immunofluorescent analysis. Importantly, many of the discoveries from this model have been confirmed using intact resistance arteries, underscoring its physiological relevance. In small diameter resistance arteries, a thin internal elastic lamina (IEL) separates endothelial (EC) and smooth muscle cells (SMC). The cells can project through holes in this elastic matrix and make direct cytoplasmic connections via gap junction channels1,2. This unique structure is termed the myoendothelial junction (MEJ). The MEJ is a small (approximately 0.5 µm x 0.5 µm, depending on the vascular bed), cellular projection composed predominantly of endothelial cells but may originate from smooth muscle as well3,4. A number of investigators have demonstrated the immense complexity of signaling networks that occur selectively at the MEJ, rendering it an especially important location for facilitating bi-directional signaling between endothelium and smooth muscle5,6,7,8,9,10. However, a mechanistic dissection of signaling pathways at the MEJ is difficult in an intact artery. Because the MEJ is a cellular projection, it is not currently possible to isolate an in vivo MEJ from the vascular wall. For this reason, the VCCC model1 was developed. Importantly, the VCCC replicates physiological endothelial morphology11 and polarization of signaling between the apical and MEJ portions of the cell12. It was this unique model that facilitated the discovery that alpha hemoglobin is in the endothelial cell, polarized to the MEJ. This is in contrast to conventionally cultured endothelial cells which do not express alpha hemoglobin13. For researchers interested in microvascular endothelium, it may be more appropriate to use endothelial cells that have been cultured in the VCCC, particularly if the intent is to dissect signaling pathways that occur in small diameter resistance arteries. Using a sturdy plastic insert containing a filter with small diameter pores (0.4 µm in diameter) to co-culture two distinct cell types prevents the cells from migrating between layers. It results in a 10 µm distance between the cells, which is significantly longer than in vivo, but still replicates many of the in vivo characteristics of MEJs, including protein localization and second messenger signaling1,14. In addition, the VCCC allows for targeting of cell type-specific signaling via the addition of an agonist or antagonist to the specific cellular compartment. For example, loading the EC with BAPTA-AM to chelate calcium, and stimulating the SMC with phenylephrine14. In contrast to other descriptions of co-culture models15,16,17,18,19,20,21, this provides instructions on isolating the distinct fractions for mRNA and protein, including the distinct MEJ fraction within the filter pores. The addition of this technique to the VCCC allows for specific investigation of changes in mRNA localization or transcription22, protein phosphorylation12,23, and protein activity12. This article will describe plating of EC on top of the filter and SMC on the bottom, although it is possible to culture the two cell types in different conformations11,18,24. Culture large 225 cm2 flasks of EC and SMC under sterile conditions at 37 °C, until 70-90% confluent. Ensure that more EC than SMC are used; if using primary human EC and SMC, typically 3 large flasks of EC to 1 large flask of SMC. Use primary cells at lower passages and do not use past passage 10. Choose the culture media based upon cells to be co-cultured. For primary human coronary artery EC, use EBM-2 EC basal media with EGM2 MV growth factors. For primary human coronary SMC, use SmBM SMC basal media with SmGM-2 growth factors. Prior to use with cultured cells, add growth factors to the media. Construction of the VCCC Day 1: Spray large (150 mm) Petri dishes and lids with disinfectant (e.g., Cavicide) and wipe away with a paper towel or lint-free wipes. Then spray the Petri dishes with 70% ethanol (EtOH) and place them in the hood to air dry. Open the plate of filter inserts (see the Table of Materials) under sterile conditions, and coat the SMC side (bottom side of filter) of the insert with fibronectin solution. Keeping the insert in the provided 6-well plate, pipet the fibronectin solution through the side slits to the bottom of the plate, making sure that the bottom half of the filter is covered (no more than 1 mL). After 30 min of treatment with fibronectin solution at room temperature in the cell culture hood, take inserts out of the plate, vacuum any excess solution, and invert, placing into the bottom half of the clean Petri dish. Set aside. Be sure not to disturb the filter insert membrane when suctioning excess solution; this can be avoided by gently tilting the plate, and vacuuming the solution off the edge of the insert. Trypsinize a 225 cm2 flask of SMC with 3 mL of pre-warmed 2X Trypsin-EDTA solution, and once the cells have lifted off the plate, add 9 mL SMC media to neutralize the trypsin (3:1, media:trypsin). Transfer to a conical tube, mix well, and pipet 10 µL onto a hemocytometer to determine cell number. Count the number of cells in 5 x 5 boxes (i.e., 18), multiply this by 10,000 to get the number of cells in 1 mL (180,000). Then multiply by 12 mL (total volume of cell suspension, 2.16 million SMC). Ensure that there are enough SMC to plate the desired number of wells. NOTE: For example, 1 well should have 75,000 SMC and thus 18 wells would have 1.35 million total SMC. Divide 1.35 million cells needed by 180,000 cells per 1 mL and this results in 7.5 mL of the cell suspension that will be needed for plating. Then calculate the final volume needed (18 wells x 750 µL = 13.5 mL). Thus, take 7.5 mL of cell suspension, bring the volume up to 13.5 mL with pre-warmed SMC media, and mix well. Plate 750 µL of the cell suspension containing approximately 75,000 SMC onto the bottom side of each filter, being careful to not spill any of the media and cell solution. Place the lid on top and carefully transfer the Petri dish with the inserts into the incubator at 37 °C overnight. NOTE: The optimum cell density for other cell types will need to be empirically determined. On day 2, fill clean 6-well dishes with 2 mL of fresh, pre-warmed SMC media. Remove the plates from the incubator. Take the inserts out one at a time and remove the media by suction, then place into the 6-well dish with SMC media. Coat the opposite side of the filter (EC side) with 1 mL of a 0.5% bovine gelatin solution for at least 30 min at 37 °C. Trypsinize the 225 cm2 flask(s) of EC with 3 mL of pre-warmed 2X Trypsin-EDTA (10x diluted in sterile Dulbecco's PBS) solution, with gentle tapping of the flask in order to lift the cells off the plate. NOTE: It may be necessary to place the flask back into the incubator at 37 °C for 1-3 min. Once the cells have lifted off the plate, add 9 mL EC media to neutralize the trypsin (3:1). Transfer to a conical tube, pool together, mix well, and pipet 10 µL onto a hemocytometer to determine cell number. Count the number of cells in 5 x 5 boxes (i.e., 60), multiply this by 10,000 to get the number of cells in 1 mL (600,000). Then multiply by 12 mL (total volume of cell suspension, 7.2 million EC). Ensure that there are enough EC to plate the desired number of wells. NOTE: Approximately 360,000 EC are required per well. For example, 18 wells require 6.48 million EC. Divide 6.48 million cells needed by 600,000 EC per 1 mL and this results in 10.8 mL of the cell suspension that will be needed for plating. Then calculate the final volume needed (18 wells x 1 mL = 18 mL). Thus, take 10.8 mL of cell suspension, bring the volume up to 18 mL with pre-warmed EC media, and gently resuspend. Plate 1 mL of 360,000 EC onto the top side of each insert filter. Let the cells incubate undisturbed at 37 °C for 24 h. Replace medium on Day 4. Harvest on Day 5. Perform the isolation in a 4 °C room and keep all instruments on ice. Keep in mind the number of individual inserts being isolated and add lysis buffer to a 50 mL tube labeled MEJ (for the isolated filters). Then label two 10 mm dishes; one for EC and one for SMC. Adjust the volume of lysis buffer depending on how concentrated the lysate needs to be; for 15 inserts, 500 µL of lysis buffer for the MEJ tube and 250 µL per Petri dish is recommended. Work with one 6-well plate of inserts at a time. Suction off the medium in the cell culture hood and then transport to a cold room on ice. NOTE: The following instructions are for 1 insert isolation. Pipet 10 µL of 1x PBS onto the SMC side of the insert. Use the cell lifter to scrape down the cells to one end of the insert, and transfer the cells from the lifter to the SMC Petri dish that has lysis buffer in it. Once the cell lifter has touched the lysis buffer in the dish, do not allow it to touch the insert filter until it has been completely wiped and dried off on paper towels. Repeat the scraping of the SMC filter at least one to two times to fully remove the remaining SMC cell debris. Turn the insert over and pipet 10 µL of 1x PBS into the upper/EC side of the insert filter. Repeat steps 2.6 and 2.7 with a cell scraper and the EC Petri dish. Collect the remaining cell and PBS slurry from the EC side of the filter with a pipette and transfer to the EC Petri dish with lysis buffer. Be very thorough in scraping the cells off both sides of the filter as to leave minimal EC/SMC contamination in the MEJ fraction. Carefully use the scalpel to cut out the filter from the plastic insert. Do this by cutting 70-80% of it away from the plastic and use forceps to pull the filter completely off the plastic insert structure. Put the filter in the 50 mL conical tube labeled MEJ with lysis buffer, and ensure it sits in the lysis buffer and remains wet. Repeat the isolation steps, in groups of 6, until all of the inserts have been processed. Ensure that different treatment groups are kept in separate tubes and dishes. Vortex the 50 mL MEJ conical tube on full strength for 15 s or until mixed well. Remove the filters from the MEJ conical with forceps, dragging them along the side walls of the tube as to leave the maximum amount of proteins and liquid in the tube. After this point, discard the filters. Once all the filters have been removed from the MEJ conical tube, do a quick spin (10-15 s at max speed ~16,000 x g) in a centrifuge to pull all the liquid and proteins to the bottom of the tube. Transfer the contents of the MEJ tube and the EC and SMC Petri dishes into separate, smaller centrifuge tubes. Optional: Sonicate the contents of the MEJ/SMC/EC tubes on setting 4 for three 10 s pulses on ice or homogenize gently by hand. Centrifuge at max speed (~16,000 x g) 15 min at 4 °C. Pipet out the supernatant and assay the lysate for protein content using the bicinchoninic assay method. On Day 5 of VCCC incubation, remove the inserts from the incubator. Working in the cell culture hood, suction off the SMC media from each of the lower wells of the insert filter and rinse two times with 1x PBS. Repeat with the EC side. Keeping the inserts intact and in the plate, add 4% paraformaldehyde (PFA) for 10-20 min in a walk-in 4 °C room on a gentle shaker. Wash both sides of the insert filter with 1x PBS for 5 min and repeat two times. CAUTION: PFA is toxic and must be handled carefully. To mount the filter on a slide, cut the filter out of the plastic insert with a scalpel mounted on a handle and place on a microscope slide with mounting medium. On Day 5 of VCCC incubation, remove the inserts from the incubator. Suction off the media from both sides of the insert filter in the cell culture hood and rinse each side of the filter two times with 1x PBS. Keeping the inserts intact and in the 6-well plate, add 4% PFA and incubate overnight in a walk-in 4 °C room on a gentle shaker. After filter inserts have been fixed approximately for 24 h in 4% PFA, transfer to 70% EtOH for at least 24 h, but up to several weeks. Process the filters on a long (overnight) run on an automated tissue processor. Use the program as follows: 70% EtOH for 30 min, 85% EtOH 30 min, 95% EtOH 30 min, 100% EtOH 30 min, 100% EtOH 45 min, 100% EtOH 45 min, Xylene 30 min, Xylene 30 min, Xylene 45 min, 60 °C paraffin 30 min, 60 °C paraffin 30 min, 60 °C paraffin 45 min. After processing, transfer the harvested filters to the embedding station into liquid paraffin, keeping the filter in the cassette. Remove the filter from the cassette, carefully using forceps to hold it just at the edge. With scissors, cut the filter in half, forming two semi-circular shaped halves. Lay each of the 2 halves on the cold plate portion of the embedding station just long enough to fill the embedding mold with liquid paraffin. Once filled with liquid paraffin, very briefly touch the embedding mold to the cold plate, then embed each half of the filter into embedding mold (cut side down); this ensures that during sectioning, one will be cutting from the center of the filter towards the edge. During embedding, use forceps to hold the filter in place to prevent the halves from falling into each other until the paraffin is cool enough for them to stand alone. Move the embedding mold to a cold plate until completely solidified. NOTE: Cooling blocks on ice trays helps to prevent wrinkled sections. For the paraffin blocks sectioning and slide mounting: cut 5 µm sections, place the sections into a 42 °C water bath, and pick up the sections using positively charged slides. Then keep slides overnight in a 42 °C oven to dry. Before beginning the rehydration steps, bake the slides at 60 °C to melt the paraffin and help adhere the VCCC sections to the slide. Cool briefly, then rehydrate the slides through two changes of xylene, 100% EtOH, 95% EtOH, one change of 70% EtOH, and two changes of distilled water. Avoid antigen retrieval methods that involve microwaving or heating as sections may fall off the slide. Perform the standard blocking for 1 h at room temperature, then the overnight incubation with the primary antibody at 4 °C, followed by washing steps and secondary antibody for 1 h at room temperature. Mount with the mounting media and coverslip. The filter inserts used for the VCCC have small, 0.4 µm holes. Figure 1A, an en face view of the VCCC filter inset, shows the pores in which the MEJ can form in vitro. The schematic depicts the smooth muscle cells plated on the lower side of the filter one day before the endothelial cells are plated on the opposite side (Figure 1B). Once the cells are plated, the EC, MEJ, and SMC fractions can be isolated three days later. 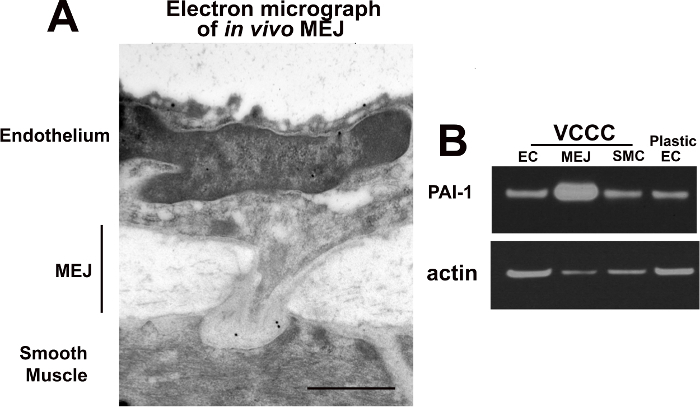 An example of this is shown in Figure 2A, where plasminogen activator inhibitor 1 (PAI-1) is highly expressed in the MEJ fraction relative to the rest of the EC, which is also seen at in vivo MEJs25. These data demonstrate the utility of the VCCC in recapitulating the intact arteriolar blood vessel wall. Next the VCCC in immunofluorescence and electron microscopy is demonstrated. The VCCC is left intact and fixed with PFA for transverse immunofluorescence. Figure 3A shows the smooth muscle specific alpha-1 adrenergic receptor and the endothelial specific bradykinin receptor. Phalloidin staining of F-actin shows the actin bridges in the MEJ (white arrow) between the two cells, which replicates the expression seen in an intact artery26. In Figure 3B, a cross-section of the VCCC as viewed by transmission electron microscopy is demonstrated, which is rendered in 3D in Figure 3C. These views of the VCCC demonstrate the ability to specifically localize proteins, receptors, and ultrastructure to in vitro MEJs. Figure 1: Plating of the Vascular Cell Co-Culture (VCCC). (A) En face light micrograph of the pores in the insert filter. Black arrows denote individual holes. (B) Schematic of plating the VCCC. Day 1 shows inversion of the filter insert and plating SMC on the bottom. On day 2, the EC are plated on the opposite side of the filter and the VCCC remains in this conformation in a 6-well plate until harvest. White arrows indicate the side of the filter where the cells are plated and will grow. Scale bar = 1 mm. Please click here to view a larger version of this figure. Figure 2: Protein enrichment in the MEJ. (A) Immuno-transmission electron microscope image of mouse artery with expression of alpha globin at the MEJ (gold beads which appear as black dots). (B) Western blot showing plasminogen activator inhibitor 1 (PAI-1) expression is enriched in the MEJ fraction versus the EC or SMC fractions. Plastic EC indicates EC grown on a plastic dish, which do not form MEJ. Scale bar = 1 µm. Please click here to view a larger version of this figure. Figure 3: Transverse immunofluorescence and electron microscopy in transverse sections of the VCCC. (A) Staining for smooth muscle and endothelial specific proteins. F-actin staining is throughout both cell types and the in vitro MEJ (white arrow). An example of electron microscopy used to study ultrastructure of the in vitro MEJs both in 2D (B) and 3D (C). Scale bar = 10 µm (A); 2.5 µm (B); and approximately 2.5 µm vertical and 0.5 µm horizontal (C). Please click here to view a larger version of this figure. The VCCC has a number of advantages in terms of recapitulating MEJs in vitro, but there are points of discussion when determining if the VCCC can be utilized for specific application. For example, if different cell types are to be used with this model, it will need to be optimized. We have used primary human cells but it is possible to isolate cells from bovine aortas24, or wildtype or knockout mice, and use them in the VCCC1,5,14. If using the VCCC for MEJ isolation, the most important technique to master is thorough scraping of the filter to ensure that the purity of the MEJ fraction is not altered by excess endothelial or smooth muscle cells. We have shown via Western blotting that alpha hemoglobin is the best marker of a "pure" MEJ isolation13, as it should be strongly expressed in the MEJ fraction versus the endothelial cell fraction. Another is PAI-1, which regulates the formation of MEJ (Figure 2)25. We feel these may be especially good markers for a robust MEJ isolation. For extra confidence in the harvest technique, the filters may be kept after scraping for harvest, and stained for EC/SMC markers25. Imaging protein expression in the VCCC can be performed in two main ways: en face (Figure 1A) or transverse (Figure 3). Both preparations allow for the visualization of proteins within the holes of the filter from two different perspectives. The en face technique involves arteries that are cut open longitudinally and then pinned out flat, with the EC facing up, to visualize both the EC monolayer and the holes in the IEL, the only place where MEJ can form. A fluorescent signal within the holes of the IEL indicates localization of the protein within the MEJ10,27. This same principle can be translated to the VCCC by imaging the EC monolayer from above, without needing to embed it in paraffin or make sections. The transverse method is more complex to master but is critical for distinct visualization of proteins in the EC versus the SMC monolayers (Figure 3). The lack of flow or stretch in the system is a potential limitation, but it is possible to add flow in an endothelial-smooth muscle cell co-culture16,19. It appears that the static conditions still allow for physiologically accurate protein expression and activation, so it may be that the heterocellular contact is the most important factor in dissection of MEJ signaling pathways. There are multiple applications of this technique beyond resistance artery signaling as the VCCC is not necessarily limited to specific cell types. Other co-culture models have utilized outgrowth endothelial cells and osteoblasts17, or modeled the blood brain barrier with endothelial and pericyte/astrocyte co-cultures21. Metastasis of tumor cells through the endothelium can also be quantified using this model21. It is also possible to grow cells on the filter and culture another cell type in the bottom of the 6-well dish to test paracrine signaling, or grow endothelial cells on the upper part of the membrane to look at polarization of the cell (our unpublished observations). Leukocytes or other circulating cells can be added to the EC media and the adhesion of cells can be quantified12. In addition, the VCCC can be used to investigate pathologies such as smooth muscle migration24 and proliferation in response to endothelial injury15,18. In conclusion, we have presented a method to isolate MEJ from an in vitro cell culture system, which allows for the investigation of signaling processes between two coupled cell types. Importantly, the co-culture system is not limited to the study of the MEJ and can be valuable to answer a number of questions, especially those involving heterocellular communication. This work was supported by National Heart, Lung and Blood Institute grants R01088554, T32HL007284 and American Heart Association predoctoral fellowship 14PRE20420024. We especially thank the St. Jude Cellular Imaging Shared Research Core, including Randall Wakefield and Linda Horner for the electron microscopy images, Adam Straub for assistance with representative immunofluorescence images, and Pooneh Bagher for her valuable feedback on the manuscript protocol. Sterile dPBS Autoclave water to sterilize. Using the sterile water make DPBS (450mL sterile water: 50mL 10X DPBS), mix and filter sterilize (0.2µm filter). sterile HBSS Autoclave water to sterilize. Using the sterile water make HBSS (450mL sterile water: 50mL 10X HBSS), mix and filter sterilize (0.2µm filter). Fibronectin to coat SMC side of VCCC thaw one aliquot and add 1mL of fibronectin (100µg/mL) to 19mLs of 1X HBSS to reach a final concentration of 5µg/mL. 2x Trypsin EDTA solution Dilute the 10X 0.5% Trypsin-EDTA to 2X with 1X dPBS (40mL DPBS: 10mL 10X Trypsin) . Bovine gelatin to coat EC VCCC Mix 0.5g bovine gelatin into 100mL distilled water. Autoclave prior to first use and store at room temperature. Keep in sterile conditions. Isakson, B. E., Duling, B. R. Heterocellular contact at the myoendothelial junction influences gap junction organization. Circ Res. 97, (1), 44-51 (2005). Little, T. L., Xia, J., Duling, B. R. Dye tracers define differential endothelial and smooth muscle coupling patterns within the arteriolar wall. Circ Res. 76, (3), 498-504 (1995). Heberlein, K. R., Straub, A. C., Isakson, B. E. The myoendothelial junction: breaking through the matrix? Microcirculation. 16, (4), 307-322 (2009). Straub, A. C., Zeigler, A. C., Isakson, B. E. The myoendothelial junction: connections that deliver the message. Physiology (Bethesda). 29, (4), 242-249 (2014). Isakson, B. E., Ramos, S. I., Duling, B. R. Ca2+ and inositol 1,4,5-trisphosphate-mediated signaling across the myoendothelial junction. Circ Res. 100, (2), 246-254 (2007). Dora, K. A., Doyle, M. P., Duling, B. R. Elevation of intracellular calcium in smooth muscle causes endothelial cell generation of NO in arterioles. Proc Natl Acad Sci U S A. 94, (12), 6529-6534 (1997). Sonkusare, S. K., et al. Elementary Ca2+ signals through endothelial TRPV4 channels regulate vascular function. Science. 336, (6081), 597-601 (2012). Ledoux, J., et al. Functional architecture of inositol 1,4,5-trisphosphate signaling in restricted spaces of myoendothelial projections. Proc Natl Acad Sci U S A. 105, (28), 9627-9632 (2008). Boerman, E. M., Everhart, J. E., Segal, S. S. Advanced age decreases local calcium signaling in endothelium of mouse mesenteric arteries in vivo. Am J Physiol Heart Circ Physiol. 310, (9), H1091-H1096 (2016). Toussaint, F., Charbel, C., Blanchette, A., Ledoux, J. CaMKII regulates intracellular Ca(2)(+) dynamics in native endothelial cells. Cell Calcium. 58, (3), 275-285 (2015). Truskey, G. A. Endothelial Cell Vascular Smooth Muscle Cell Co-Culture Assay For High Throughput Screening Assays For Discovery of Anti-Angiogenesis Agents and Other Therapeutic Molecules. Int J High Throughput Screen. 2010, (1), 171-181 (2010). Biwer, L. A., et al. Two functionally distinct pools of eNOS in endothelium are facilitated by myoendothelial junction lipid composition. Biochim Biophys Acta. 1861, (7), 671-679 (2016). Straub, A. C., et al. Endothelial cell expression of haemoglobin alpha regulates nitric oxide signalling. Nature. 491, (7424), 473-477 (2012). Isakson, B. E. Localized expression of an Ins(1,4,5)P3 receptor at the myoendothelial junction selectively regulates heterocellular Ca2+ communication. J Cell Sci. 121, (Pt 21), 3664-3673 (2008). Axel, D. I., et al. Induction of cell-rich and lipid-rich plaques in a transfilter coculture system with human vascular cells. J Vasc Res. 33, (4), 327-339 (1996). Hastings, N. E., Simmers, M. B., McDonald, O. G., Wamhoff, B. R., Blackman, B. R. Atherosclerosis-prone hemodynamics differentially regulates endothelial and smooth muscle cell phenotypes and promotes pro-inflammatory priming. Am J Physiol Cell Physiol. 293, (6), C1824-C1833 (2007). Herzog, D. P., Dohle, E., Bischoff, I., Kirkpatrick, C. J. Cell communication in a coculture system consisting of outgrowth endothelial cells and primary osteoblasts. Biomed Res Int. 320123 (2014). Jacot, J. G., Wong, J. Y. Endothelial injury induces vascular smooth muscle cell proliferation in highly localized regions of a direct contact co-culture system. Cell Biochem Biophys. 52, (1), 37-46 (2008). Scott-Drechsel, D., et al. A new flow co-culture system for studying mechanobiology effects of pulse flow waves. Cytotechnology. 64, (6), 649-666 (2012). van Buul-Wortelboer, M. F., et al. Reconstitution of the vascular wall in vitro. A novel model to study interactions between endothelial and smooth muscle cells. Exp Cell Res. 162, (1), 151-158 (1986). Heberlein, K. R., et al. A novel mRNA binding protein complex promotes localized plasminogen activator inhibitor-1 accumulation at the myoendothelial junction. Arterioscler Thromb Vasc Biol. 32, (5), 1271-1279 (2012). Straub, A. C., et al. Compartmentalized connexin 43 s-nitrosylation/denitrosylation regulates heterocellular communication in the vessel wall. Arterioscler Thromb Vasc Biol. 31, (2), 399-407 (2011). Cucina, A., et al. Vascular endothelial growth factor increases the migration and proliferation of smooth muscle cells through the mediation of growth factors released by endothelial cells. J Surg Res. 109, (1), 16-23 (2003). Heberlein, K. R., et al. Plasminogen activator inhibitor-1 regulates myoendothelial junction formation. Circ Res. 106, (6), 1092-1102 (2010). 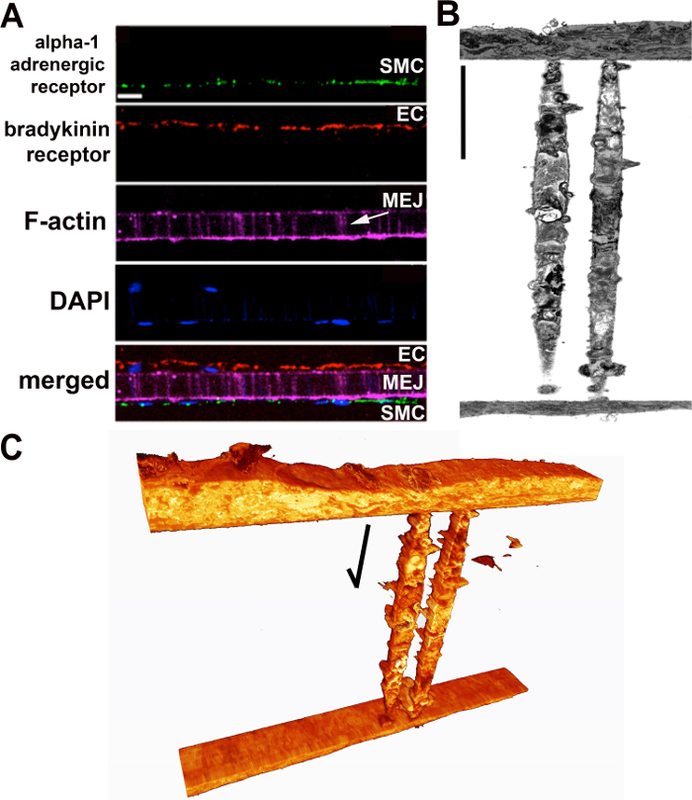 Isakson, B. E., Best, A. K., Duling, B. R. Incidence of protein on actin bridges between endothelium and smooth muscle in arterioles demonstrates heterogeneous connexin expression and phosphorylation. Am J Physiol Heart Circ Physiol. 294, (6), H2898-H2904 (2008). Biwer, L. A., Isakson, B. E. Endoplasmic reticulum-mediated signalling in cellular microdomains. Acta Physiol (Oxf). 219, (1), 162-175 (2017).